Ravenscraig is a superb guest house accommodation base for a variety of activities in and around Aviemore and the Highlands of Scotland. Activities to enjoy in this beautiful and unique region of Scotland include fishing, golfing, skiing, walking, hill climbing, bird watching, touring, Highland gatherings and much more. Within a few minutes walk of our Aviemore Guest House, you will find Traditional Scottish fare, Indian, Chinese, fish and chips, Italian and just some great pub food on offer. Aviemore and the Cairngorms are an important tourist destination in the Highlands and this is reflected in the huge variety of 'eateries' to suit all budgets and tastes. Aviemore is Scotland's number one ski and snowboarding resort with a full range of facilities and instruction for both sports. The Cairngorm Mountain, in the heart of the National Park, has been providing skiing for more than forty years, and with the addition of the new funicular railway in 2001, is still competing as a major winter sports destination. We are very fortunate to have a second ski resort close by. The Lecht is just 40 minutes drive from Aviemore and operates 14 lifts and is the local's choice for learning to ski and for young families - plus they have the added benefit of being, Park Up and Ski within 5 minutes. The Ravenscraig Guest House is well placed for access to the local hire shops in the village offering hire, instruction and lift passes. The ski bus to the Cairngorm Funicular stops right outside and runs hourly if you do not wish to take the car. SKI SHACK - For all your ski, snowboard, ski-boards, smorgasbording, blades...you name it, they can get it - plus they are great craic! (just a 2 minute walk from RGH) - they can even arrange your lift passes for the mountain as well. Beat the queues and email them in advance with your Shoe Size, Height and Weight along with your arrival date and the number of people requiring equipment hire. 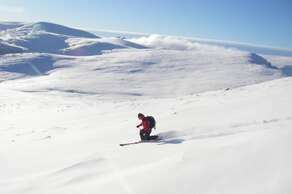 Ski touring/mountaineering is also becoming very popular in the area - what an awesome way to explore the stunning Cairngorms. Look no further than the team at G2 Outdoors. They offer an amazing experience with quality instruction, guides with the craic' and can arrange all the equipment, bells and whistles! The Cairngorms provide some of Scotland's most challenging walking, with no fewer than 49 Munros and half of Britain's eight mountains over 4,000 ft (Ben MacDui, Cairn Toul, Braeriach, and Cairn Gorm). These mountains come into their own in winter, providing experienced climbers with a wide range of classic ice climbs. At a much lower level there are over 50 miles of footpaths through the area, including some lovely walks through the forests and around the lochs. There are also ranger-led guided walks. More information can be found on www.rothiemurchus.net. The Rothiemurchus visitor centre can provide free visitor guides and maps of the walks/cycle paths. Another good area for walking is around Glenmore Forest and Loch Morlich. Visit www.walkhighlands.co.uk/cairngorms for more information on all levels of walking. There must be a very good reason for the programme Spring Watch to be based here in the Spey Valley ....The Spey Valley is teeming with wildlife, apart from the interesting variety of birds, you may also spot a red squirrel from the breakfast room. There is a badger watch in the local area held on evenings throughout the warmer months...badgers are not the only creature to be spotted...pine martens often put on a show. Mornings are the time to spot the rare and very strange capercaillie, and if you can rise early enough, there are 'watches' from the hides at Abernethy during the season. We are lucky to be in the centre of a wonderful area for birdwatching. There are 6 RSPB reserves easily accessible by car, amongst them, the famous and important wetland habitat of Insh Marshes. Loch Garten and the Abernethy Forest, Findhorn Valley and Spey Bay are other well known local ones. We are a popular guest house for birdwatchers and encourage all enthusiasts to log their findings in our bird journal, which provides an interesting and informative guide for newcomers to the area. You are welcome to leave one of your photos for inclusion in the collection of wildlife photographs adorning the walls of the house. Mountain biking is becoming more and more popular. There are miles and miles of cycling tracks around the Aviemore area including a newly built track leading from the Cairngorm Mountain back into the village, which takes you through the Glenmore Forest and Rothiemurchus estate. There are many shops that hire out bikes by the half-day, day or weekly and provide trail maps. Here at the guest house we provide a lockable shed for bike storage and you will find a selection of maps and trails in the lounge. We can highly recommend Cycle Wild Scotland for those individuals and groups wanting to learn more skills. Jules Fincham is based here in Aviemore and runs mountain biking courses to share his passion for the sport. Aviemore is an ideal base for exploring and has a wide range of activities on the doorstep as well as over a dozen bars and restaurants to suit all tastes and pockets, and all within walking distance of the guest house. We have information on all the local attractions in the lounge and are happy to help with the planning of your days out. A 4 star attraction for the whole family. A great day out, with water slides, Tree Top Trails, climbing walls , adventure playground to name but a few. You can even watch the red squirrels in their native habitat. A park where you can watch some of the native tundra animals;from bison, otters and grouse to the even more unusual tigers and monkeys. The train runs every 15 minutes all year round, taking you almost to the top of the Cairngorm Mountain where you can visit the exhibition, shop, viewing area and the highest restaurant in Britain. A favourite with our family. Visit the reindeer in the centre and then walk a few minutes into the hills and feed the wild herd, hand to mouth, whilst you learn all about these incredible creatures in their natural habitat. Aviemore's brewery making quality beers. Tours of the facility daily. WHISKY This is Jonathan's favourite subject! Within easy driving distance (but designate a driver!) we have the world's largest malt whisky distilling area. The Spey Valley is the home of the annual spring 'Spirit of Speyside' whisky festival www.spiritofspeyside.com and the Malt Whisky Trail www.maltwhiskytrail.com Some of the finest whiskies in the world are proudly and lovingly produced in this 'neck o' the woods'. Once tasted, this amber liquid becomes a pleasure to be repeated and the tasting of different single malts and blends, a must. Many of the distilleries have excellent visitor centres where you can learn all about the distilling process and sample the produce.